Study subjects at beginning of research project. This is the first in what I expect to be a continuing series of reports on my long-term study of the effect of genetics and environmental conditions on the development of twin human beings. I am not a scientist but I did own a chemistry set and a microscope when I was a kid. I’m not a theologian but I did minor in philosophy in college. The sample of subjects I’m using in my study would not qualify as statistically significant. I’m likely to let my emotions influence my findings. The title of this study: Grampa Jim Watches the Twins. 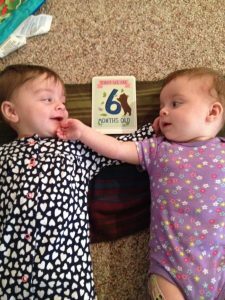 I got the idea to conduct this study about seven months ago when my daughter and her husband had twin girls. They are fraternal twins, not identical twins. But when I met them shortly after their arrival I was hard-pressed to tell one from the other. Study subjects at six months of research project. 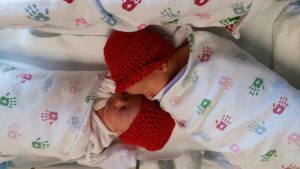 By six months even someone meeting them for the first time would realize they aren’t “identical” twins. But they continue to look much alike. And they clearly are individual persons with very different personalities despite having the same parents, being born together, living in the same environment, eating the same food, and getting the same amount of attention. One is bigger. One has darker hair. One is extremely outgoing which her sister is more reserved. One started crawling sooner – but her sister already feeds herself. When I sit one on my lap while I play the piano she seems quite disinterested – her sister wants to bang on the keys. In preparing for my research project I googled “twin studies genetics vs environment” and learned that many scientists have been studying twins for the answer to what seems to be a long-standing question: Are we the products of our heredity or our environment? Scientists do interesting things like track down twins separated at birth and raised in different environments to determine whether they both like ketchup on eggs or became musical prodigies. Results are inconclusive. As I start my research, I have a strong belief that the answer to “nature vs. nurture” is yes. It is both. Absent nature, my granddaughters would not have such closely related genetics that determines some common physical characteristics. Absent nurture, they would not be encouraged in their individuality and the opportunity for growth and expression. I agree with Horton. What is more, I think we need to remember that any person is a person. Each is an individual unlike any other, unique, a gift to the world from heaven above. The breath of life comes from neither genetics nor environment. It comes from God. It is precious. Jim Fair is a writer and consultant. He lives in the Chicago area and has a wonderful wife, son and daughter. He enjoys fishing and occasionally catches something. He tries to play the piano and sings a little. In addition to writing for Regnum Christi Live, he blogs at Laughing Catholic. And you can follow him on Twitter: Jim Fair (@fishfair). This entry was posted in RC Live. Bookmark the permalink.